Fields and terraces in the Anaga Mountains. 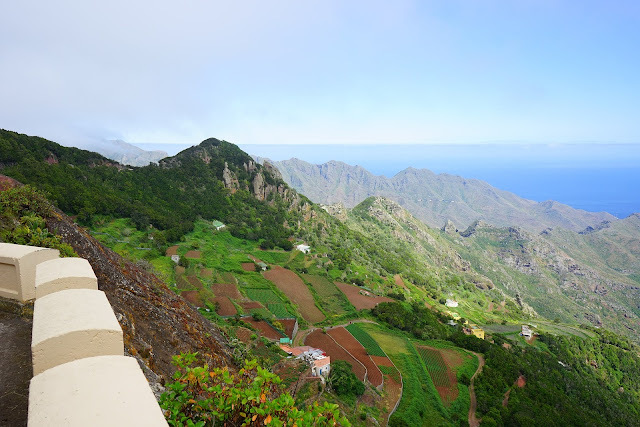 This is rural Tenerife as you’d dream it. From 17 to 22 June Taucho, an Adeje village in the hills above Los Menores, celebrates the the VIII Taucho Ethnographic Days as a run up to the local fiestas in honour of the Virgen de Coromoto between 24 and 27 June. The theme this year is ‘walks, paths and landscapes’ and events are organised by the local fiestas committee and the Adeje department of heritage under Councillor Juan Desiderio Afonos Ruiz, who said that the entire programme of ethnographic days plus fiesta “has been put together by a team made up of the local fiesta committee, the neighbours of Taucho, the Asociación Cultural Imoque and the El Cardón group, who, together with the council, have made this event a reality”. Arona Ayuntamiento has announced that demolition works on the ruins of the building which collapsed in Los Cristianos on 14 April killing seven people (link) will start next Monday, 20 June, and are expected to last a fortnight. The council held meetings yesterday with residents and owners of the twenty four dwellings and nine commercial units in the four adjoining buildings of the processes involved, and advised them that the works will require their temporary evacuation for safety reasons, and because their accesses would in any case be blocked for the duration. It’s become an established and popular annual event since it started five years ago, and this year’s Arona en Colores will be held in Las Galletas on Saturday 18 June, 10am to 10pm. The council calls it a multicolour urban fiesta which is intended to boost the area’s commerce, but apart from shopping, there will also be live music, four stages for performances, exhibitions, displays, prize draws, and competitions throughout the day. The Original Blues Brothers Band are the latest confirmed act for the Legends Live series of concerts. Most of the founding members have either retired or died, but a couple remain. MARIANO Rajoy, acting Spanish Prime Minister, has warned that UK citizens could forfeit crucial rights – including free healthcare in Spain – to live and work across Europe, if the Brexit vote triumphs in this month’s UK referendum.